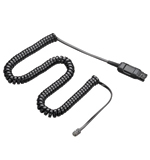 This direct connect headset to phone cable easily connects a Plantronics H-Series headset to most headset-ready phones via the headset port. Works with EncorePro, DuoPro, TriStar and SupraPlus Wideband headsets. Amplifier not needed when using this cable.